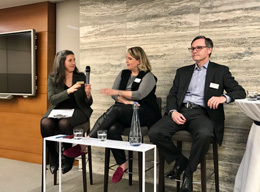 The Association of Women in Finance (AWF) had the pleasure of hosting Lisa Skakun, Chief Legal and Administrative Officer for Mogo Finance Technology, and David Finnie, Chief Risk Officer at Central 1 Credit Union, at our latest Vancouver Fireside Chat series. 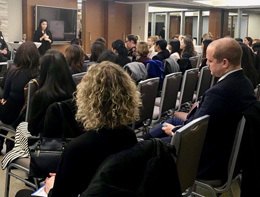 The event was held at the offices of Borden Ladner Gervais LLP (BLG), and our guests treated to drinks, appetizers and an evening of networking and conversation moderated by Melanie Bradley, AWF Director, and Partner at BLG. Lisa and David opened up to the audience in a broad discussion about career development that reached far beyond the headline theme of “Rising to the Top: Making Risky Career Moves”. We were able to gain insight into the professional paths each of our speakers has taken, and receive tips on when and how to make big career moves. Lisa and David reminded us not to fear change, to be self-aware and to always be on the lookout for new opportunities to build our business and personal skills. Although our speakers have had very different career paths and experiences, they both emphasized the importance of raising ones hand, taking on new challenges, and networking effectively. 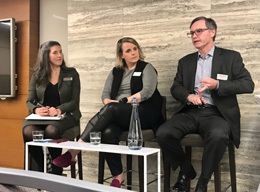 A heartfelt thank you to all the attendees, our co-presenting partner: the Risk Management Association, generous sponsors: Borden Ladner Gervais LLP, BDC and Alvarez & Marsal, our moderator, and guest speakers for another successful AWF Vancouver Fireside Chat series event!